Which Sailboat Accessories Are the Absolute Must-Haves? Whilst some sailboat accessories are just nice to have, others are fundamental to the safe and enjoyable sailing experience we all aspire to. But one skipper's 'nice to have' is another's 'essential bit of kit'. But set off on a short-handed ocean passage in a sailboat that didn't have a windvane self-steering gear? I wouldn't. 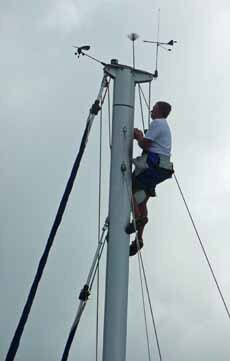 And although self-tailing winches aren't essential, they certainly make sail hoisting and trimming a lot easier. Clearly we all have our idiosyncrasies, but just what sailboat accessories are we talking about? Try to ignore the handsome chap pretending to fish, and concentrate instead on the boarding ladder attached to the port side of the stern. Not only is this ideal for emerging swimmers, it also makes clambering aboard from the inflatable dinghy a cinch. This is a bespoke model fabricated in stainless steel which hinges up to the transom when we're underway. It can be locked in this position which prevents any light-fingered boarder making-off with the liferaft. 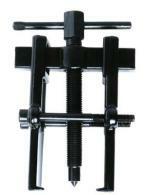 Proprietary boarding ladders are available, many of which are designed to hook over the toe-rail. Others are designed to help swimmers get back in the dinghy and yet more enable a dog to get back aboard safely. 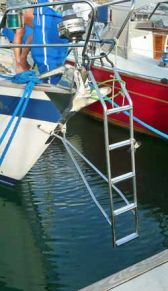 A very useful sailboat accessory, is the boarding ladder. Strange word, passerelle; sounds French. But it's just a fancy name for a gangplank, and the one shown here - complete with handrail and dinky little wheels - is as fancy as they come. 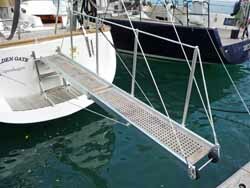 Cleverly, the fixing of the inboard end is incorporated into the design of the boarding ladder. Most of us cruiser types make do with a simple wooden plank with pairs of holes drilled at each end and with screwed-on lateral battens to prevent painful slips and prompt immersions. Underway they're lashed to the stanchions, and frequently are seen with spare fuel and water canisters lashed to them. In use, passerelles of this type are lashed in position horizontally and supported by a pair of lines to the gantry if you have one or the quarter rails on the pushpit if you don't. Many of us prefer to go bows-to when berthing in a marina, as this gives mare privacy for cockpit loungers, but it can create a few problems getting on and off. On Alacazam, we tend to scramble up and down on the anchor, and have the scarred shins to prove it. The skipper of this Halberg-Rassey 42 has come up with a much better idea, a stainless bow-ladder. An ingenious sailboat accessory, but it must be an awkward beast to stow. Sensibly, he's made sure that the boat can't surge further forward, keeping the ladder well clear of the dock. Otherwise a falling tide could create quite a bit of damage. Call me a wimp, but going aloft by any method isn't an event that I look forward to with any great enthusiasm; I'm always mighty pleased to back safely on deck, where I tend to strut about proudly for a while.. Traditionally, the the way to get aloft was by either shinning up the ratlines or by getting a crewmate to hoist you up on a bosuns chair. These days there alternative ways of getting you up there, including folding mast-steps, mechanical hoists and rope climbing gear developed by rock climbers and mountaineers. Even in a well designed galley, there's no doubt that cooking at sea can be a perilous affair. Where else but on a yacht would you even contemplate handling boiling liquids and hot metal utensils on a rolling, lurching platform? A well designed and constructed cooker will go a long way towards protecting you from these very real risks. So what goes to make a good, safe cooker for a cruising boat? And what better on a balmy summer evening, than to cook your food on a taffrail-mounted boat grill? Cruising around the UK in winter, you'd be forgiven for shrugging these off as being a total waste of space. But in the tropics, you may just change your mind - and having done so, what should it be? A top-opening or front-opening boat fridge? And to help you fill it, a few items of fishing equipment may well be a good investment and won't make much of a dent in your sailboat accessories budget. Pretty much the reverse of the above - a waste of space in the tropics but just the thing anywhere else. But what type of cabin heater? Gas oil (diesel) or paraffin (kerosene) fuelled? Indirect or direct heating? It's not often you get something for nothing, but with a boat water heater (a calorifier) - after you've bought and installed it - hot water comes free. 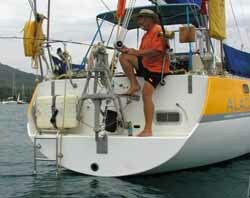 A reverse osmosis marine watermaker can be the most infuriating of all sailboat accessories if you don't use it regularly. Unused for a day or two, all kinds of macrobiotic nasties set up home in the membrane where they set about polluting what would otherwise be fresh, clean drinking water. The golden rule is run your watermaker every couple of days if you can, or treat it with a biocide solution if you can't. Although the low-tech 'Bucket and Chuck It' approach to this did have its advantages in terms of simplicity, economy and versatility, this technique seems to be astern of us accept maybe for a few - presumably singlehanded - stalwart old salts. Plumbed-in sea toilet systems with valves and seacocks are the way to go (oops, sorry) and for an increasing number of sailboats, marine holding tanks too. All modern cruising boats are installed with reliable engines these days, and unless specified otherwise, a fixed-bladed propeller. Under sail, a fixed three-bladed prop will have a similar affect on boat speed as towing a bucket. The modern approach is to link all the electronic navigational instruments together into a single fully-integrated system. That way the wind, speed and depth instruments can all talk to each other and come up with such useful data as 'velocity made good to windward', 'true wind speed', 'wind angle off the bow' and so on - and display it all on the chart plotter, along with a visual representation of all the shipping around you as collected by your Automatic Identification System (AIS) unit. The electronic autopilot can follow the route set on the GPS unit, and the radar display will provide MARPA (Mini Automatic Radar Plotting Aid) collision avoidance functionality. A VHF Radio will provide short range ship-to-ship and ship-to-shore communication, but for longer range communication you'll need an SSB radio or a satellite phone. Many of us make use of a laptop computer for sending emails and chatting on Skype, and use a wifi enhancer to greatly improve the broadband signal. These sailboat accessories we all hope will remain stowed in their respective bags and need never be deployed in anger. 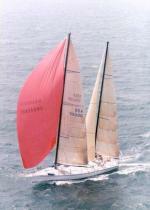 The first of which is a set of storm sails; a storm jib and a storm trysail.